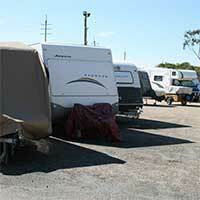 For Caravan Storage Coomera - Oasis Ticks All The Boxes! With Oasis Storage, you can rest easy knowing your caravan, boat or motorhome are kept safe and secure at our brand new facility. Don't forget your household items too. It could be time to de-clutter your home, freeing up more space for the important stuff! Rent storage space for as long as you want; we put you in control! A great feature that we provide is a store to buy locks, boxes, and tape (along with other moving and storing supplies). Also, we offer a boat and caravan cleaning service. With Oasis Storage you get better value for less money. Find out more about our excellent services, get your caravan stored safely and finally off your lawn! Call Oasis Storage today. For Cheap Yet Secure Caravan And Boat Storage In Coomera - Come And See Us! We understand the importance of keeping caravans, boats, cars and all of your valuable possessions completely safe. So, no matter if it's the larger items from your driveway or yard, or simply de-cluttering your home. Reclaim your personal space - fantastic value storage, secure facility. With easy access and nice wide driveways. We make storage simple to use! Also, we focus on excellent customer service; that's why our clients stay with us. Our team are here to help, tell us what you want; we can then advise the best option to suit your needs. Better still why not pop in and have a chat with one of our team members. Look around our modern facility and see for yourself! If you require local, and great value caravan, boat or household storage in Coomera, Oasis has the perfect solution.